Correction: Since contract awards must be approved by a board majority (five or more votes), the balcony painting project was not awarded, as the vote in favor of it was 4-3. Two board members were absent at the meeting. An earlier version of this story erroneously indicated that the motion was approved. 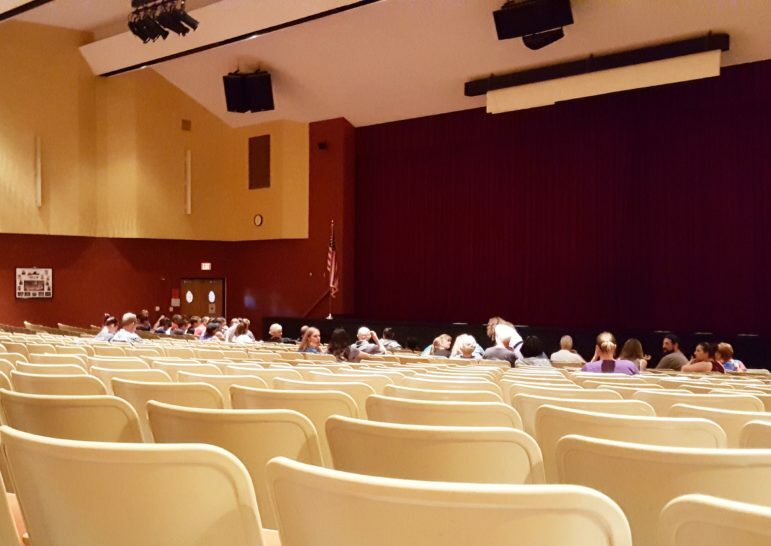 The Saucon Valley School Board president said at Tuesday night’s meeting that she strongly objected to spending money to paint a portion of the high school’s auditorium that is normally only used once a year, as part of a larger auditorium renovation that will take place. Susan Baxter voted against spending more than $6,000 to replace drywall and paint the upper balcony section of the auditorium, which she said is only used for seating when graduation exercises are held each June. The balcony painting is part of a larger refurbishment of the 1970 auditorium, which includes painting the entire room and replacing the seats. Carpeting that acts as soundproofing on a back wall will be removed and replaced with painted drywall, he added. “Was there a wallpaper section in that area too?” asked board member Edward Andres. Bonenberger confirmed there is wallpaper in the upper balcony and said that section would be repaired–because it’s separated from the wall–and painted. “We could glue it down,” said Baxter. Board member Bryan Eichfeld said the wallpaper would be painted over to match the rest of the repainted auditorium. The motion to approve painting the balcony failed by a vote of 4-3, since contract awards must be approved by a board majority (five or more votes). The Saucon Valley High School auditorium (FILE PHOTO). projects fund and the remainder from fund balance. In addition to new seats, the total cost also includes new carpeting, new flooring, control table improvements and renovations to achieve ADA compliance. Awarding of the contract for the Auditorium Renovation-Alternate 1 to CMG of Easton, in the amount of $31,450 for painting the main auditorium walls and one section of ceiling which has water damage, to be funded by any remaining capital projects fund and the remainder from fund balance. Awarding of the contract for the Auditorium Renovation-Alternate 3 to CMG of Easton, in the amount of $4,885 for painting the black wall behind the stage to be funded by any remaining capital projects fund and the remainder from fund balance. Several board members also questioned the need to repaint the black wall behind the stage. Eichfeld said that although as a member of the board’s facilities committee he recommended repainting it, but had changed his mind. Board members Mark Sivak and Shamim Pakzad were absent from the meeting. The entire meeting can be watched on YouTube. View the agenda here.